Famed Altmer Psijic and leader of the Order's council beginning some time before 1E 20. In the early Second Era, he welcomed an eleven-year-old boy to the order, and gave his new pupil the name Vanus Galerion. 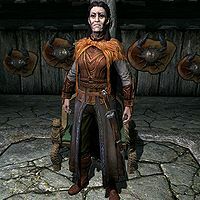 Iachesis was one of the people Galerion had to answer to when he began collecting mages from all over Summerset Isle; while Galerion's charter was granted by the King of Firsthold, it's unclear whether Galerion ever gained his mentor's support. Artaeum vanished around the time of the founding of the Mages Guild, and when it returned five hundred years later, the Psijics were led by Loremaster Celarus. They would not, or could not, offer any explanation for what happened to Iachesis. He was later featured a character in the historical fictions 2920, The Last Year of the First Era and The Wolf Queen. A Redguard hero of the rebellion on the Island of Stros M'Kai in 2E 864, along with her brother Cyrus. The rebellion crushed the Imperial presence on the island, killing the provisional governor Amiel Richton, and led the way to a peace treaty between the Empire and Hammerfell that was more favorable to the Redguards. Esta página foi modificada pela última vez à(s) 18h45min de 3 de março de 2016.